The Dewalt 18-Gauge nailer is compact and easy to use a cordless tool, it is also one of the best in the market nowadays. Dewalt DC608K has done a great job combining speed and also precision in this tool, mainly thanks to its pneumatic nailing, and it’s sequential and bumps operating modes. It also weighs 7.5 pounds and it is powered by an 18 Volt rechargeable battery. Saying you need a nailer is too general, you will surely be asked what kind of nailer. Also, a lot of kinds to choose from each varying from depending on what kind of project you will be using it for. A brad nailer, for example, is used for attaching trims and small moldings. You can also read a full description of this product here. 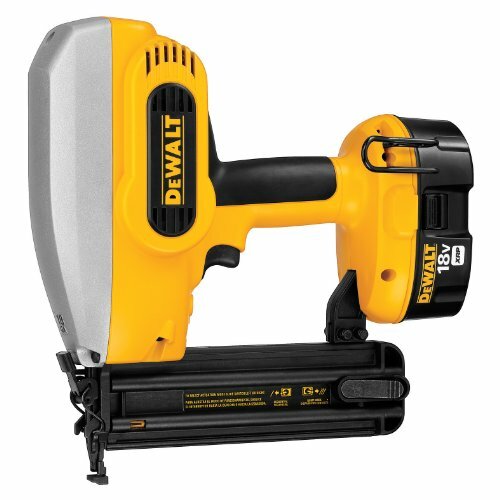 Who should buy the cordless Dewalt DC608K? First of All, The cordless Dewalt DC608K nail gun is perfect for small projects: home remodeling projects, trimming jobs, and also paneling. Other than that, it can be used by homeowners, carpenters, or cabinetmakers for crown molding and foot molding, as well as in installation sites. Lastly, We recommend this tool for DIY amateurs and professionals alike. 3 reasons why you need a brad nailer in your tool collection. If you are one of the people of are crafting every now and then, an 18 gauge brad nailer is handy. There are times when a nail won’t stay and this is where this nailer will save the day. For contractors also, having a brad nail is critical. You never know when you needed to replace the thin nails in window casings or crown molding. It may not be on the top list of must-buy tools but with this nailer, other tools will work better. Finally, Installing baseboards requires a brad nailer. One that has a lot of power also with the perfect nose and nail size. You may have to change your trims and baseboards often than you might think you need to. Being a little too heavy, Women will also be better off with a lighter nail gun like this one. As with all Dewalt tools, you don’t have to worry about the warranty. because It is backed by a DEWALT 90-day money-back guarantee, a three-year limited warranty, and a two-year service contract on the XRP battery. We have also gathered for you what other people who bought/used this Dewalt nail gun have said about it. To sum up, we think that the Dewalt DC608k is a perfect nail gun for a multitude of user categories. We recommend this drill for DIY amateurs planning on a light usage around the house as well as for professionals working on bigger woodwork projects. However, as we said earlier, the DC970K is not very suitable for women because of its heavy weight. It is very functional, adjustments work exactly where they’re needed, Also, the instructions are easy to follow, needs little to no maintenance, well balanced and can be used comfortably at different angles. Overall, it is practically flawless and has many great features. Our Final Rating is 4.5 stars. We crawl the web regularity to find the best price or reliability ratio for the products you need. After extensive research, as a result, we recommend that you buy this Nail Gun at Amazon, as they offer, in our opinion, the best price-to-reliability ratio. The DeWALT DC608K 18 Gauge Cordless Brad Nailer is the ideal tool to expand your 18V tool collection, especially if you find yourself doing smaller trim and repair jobs.We think many will find the portability and versatility a worthy trade-off. For our Performance rating, we gave the tool an 8/10 because it really did have the power and ability to keep up with our air nailers and it did it with no cords attached.